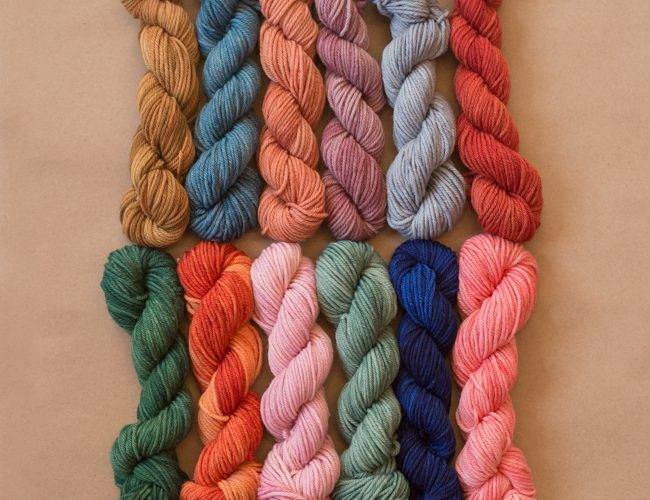 There are two things you may already know about Ann and me: we love mini skeins, and we adore the US-grown, US-spun yarns that Jill Draper dyes by hand in her Hudson Valley studio. 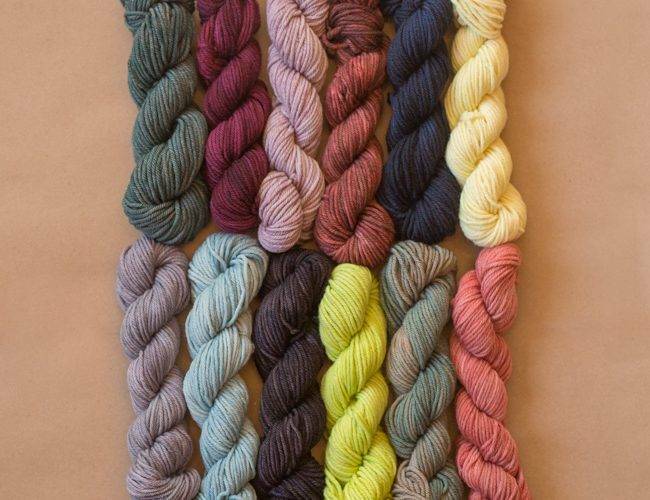 So it’s only natural and right that we asked Jill Draper to cook up three different sets of 12 mini skeins in her soft, beautiful Windham merino yarn. 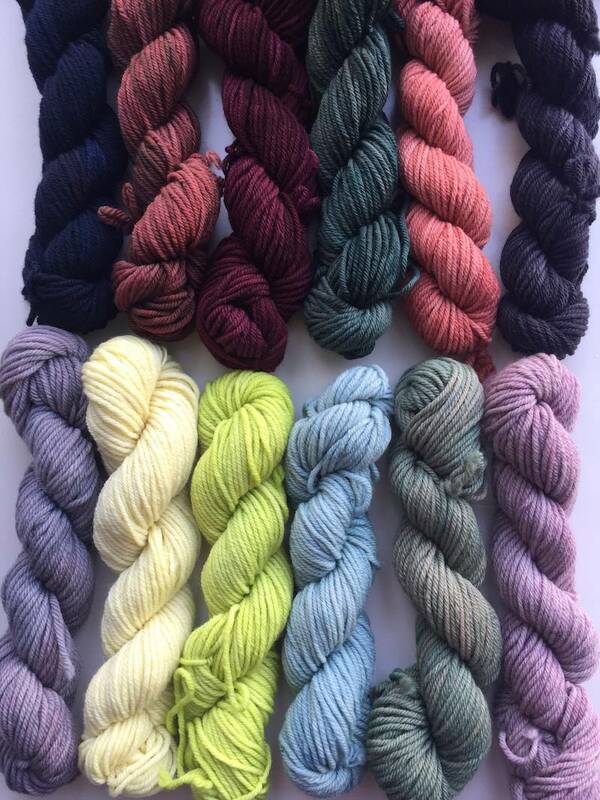 Each colorway of 12 mini skeins was dyed to reflect a specific color story or mood, but they all play well together and with other worsted weights, should you choose to combine these yarns in an epic colorwork project. 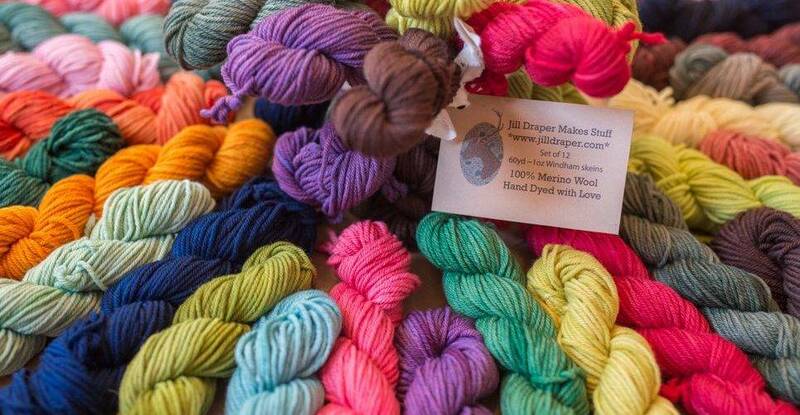 The individual colors don’t have names, although in a few cases they may match standard colors for Jill’s yarns. Dyeing these skeins for MDK was a romp for Jill Draper, who had free rein to cook up bunches of mini skeins in delightful colors. Jill is an incredible colorist; there is artfulness and always an unexpected zing to her combinations. There are three colorways. We gave them names, because a shop needs things to have names. Try not to let the names influence your response to the combinations. What looks “summery” to one person may evoke an entirely different response in another. 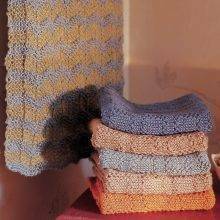 Cabana, a summery bundle of red, orange, pink and green tones, with three beautiful blues. Posy, a mixed bouquet of intense brights, with paler greens and brown for contrast. Rosita, a mix of muted shades with flashes of spring green and pale yellow, inspired by love of the improbably beautiful color juxtapositions of Missoni stripes. A practical note: Windham is not treated to be superwash (aka machine washable), so wash your project by hand in cool water, and lay flat to dry. Our Next Question: What Should We Make? Petting these beautiful skeins, arranging and rearranging them, stacking them on the coffee table, is enough. 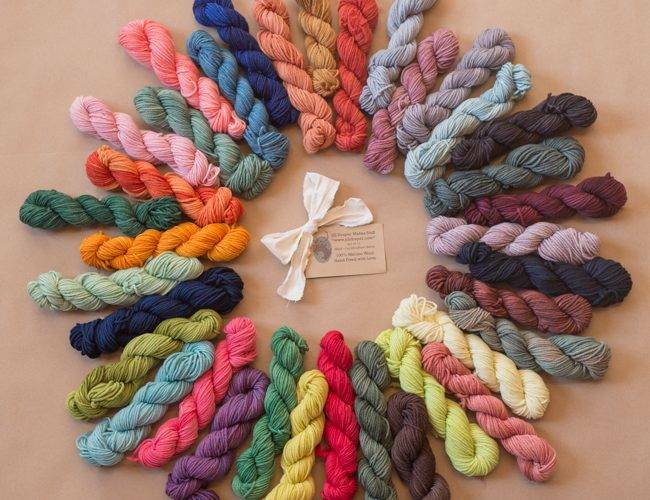 Like any thing of beauty, Windham mini skeins need only exist, and we are happy. 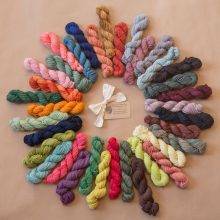 But beautiful yarns cry out to be knitted, so we’ve given some thought to potential projects for Windham Mini Skeins. We are beginning to think that Dangling Conversation is the universal donor, the Type O of knitting patterns. 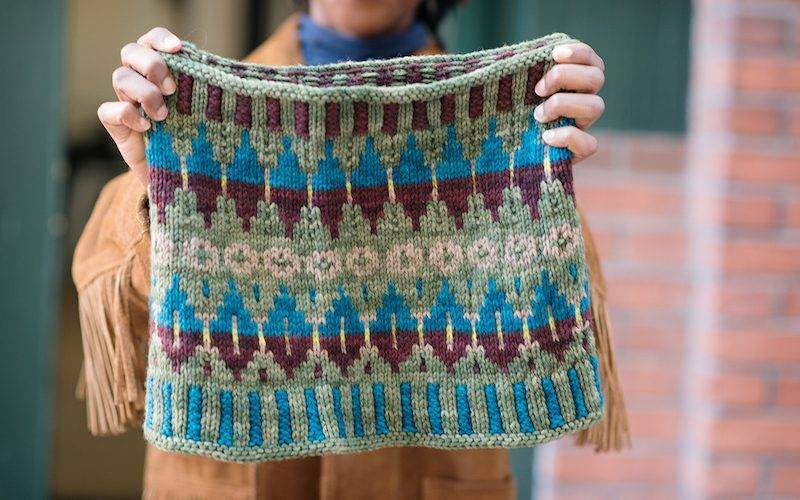 Ravelry is currently showing over 1600 projects for this beloved pattern, in every fiber under the sun, and in solid colors, multi-colors, and color-shifty ombres and gradients. They are all beautiful. Each one is a super handy Accessory-Type Item to enhance the wardrobe. We love Dangling Conversation in linen, and we know that we will love it in soft, light merino wool. The reason Dangling Conversation works so well for mini skeins is that you work a row of eyelets every time you start a new color. This makes the color changes look meant-to-be. There is no indecision about when to start a new color; you start a new one when you are just about to run out of the old one. 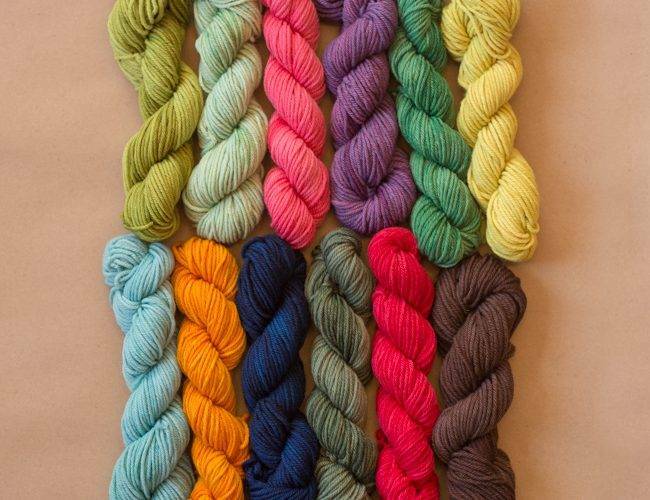 Somebody please make a Dangling Conversation in Windham Mini Skeins–we want to see it! 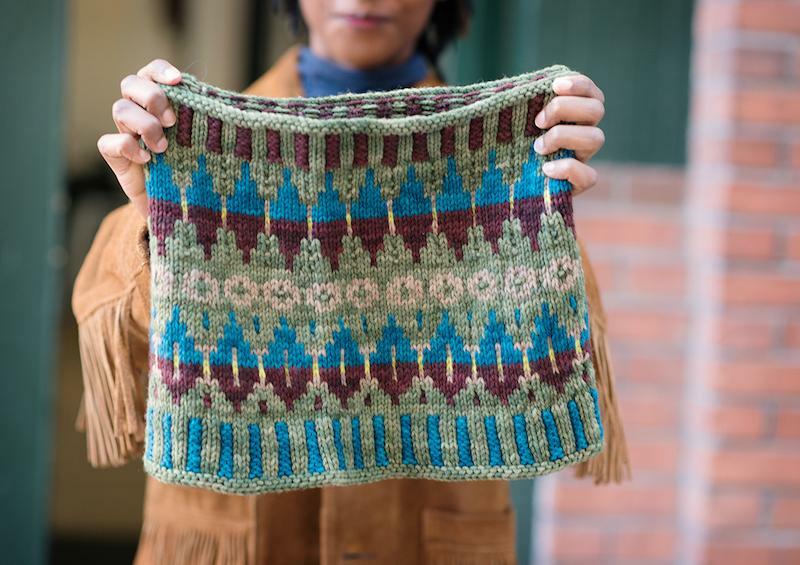 As it happens, Jill Draper herself has a great pattern for Windham, Just One (More) Row. I jumped in on this pattern with both feet this past weekend. My first decision: how to sequence the colors for maximum stripe contrast. It was pretty easy to sort the colors into darker shades and lighter or duller shades. I hemmed and hawed for only the absolute minimum amount of time, and decided to pair them just as shown in this photo. Then I started off. The “just one row” is easily memorized. 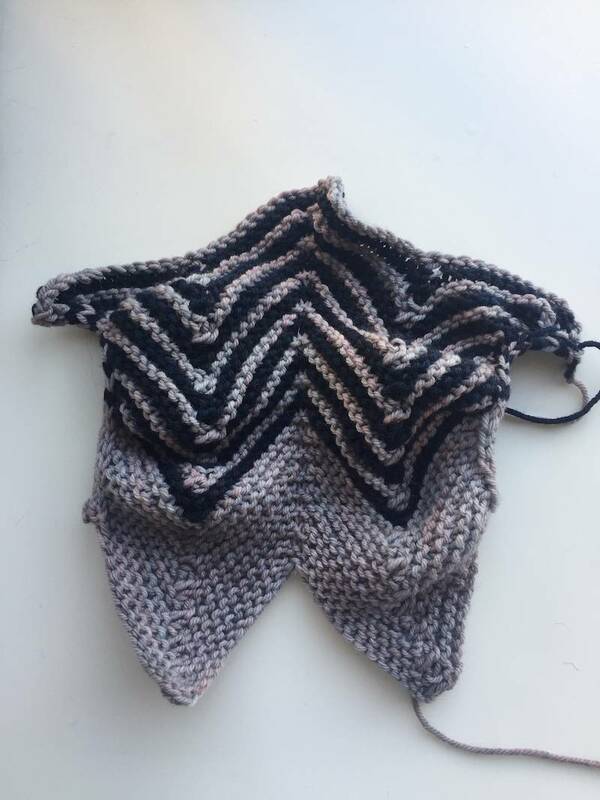 Because you work the chevron increases and decreases on both sides of the fabric, it’s got a three-dimensional, topographical quality as it comes off the needles. I was worried–was the i-cord too short? Would things flatten out with blocking? I couldn’t stand the suspense, so I bound off (temporarily! I can undo it!) and washed and blocked what I was now (temporarily) calling my swatch. PHEW. When will I learn to believe in blocking? Blocking is the best! 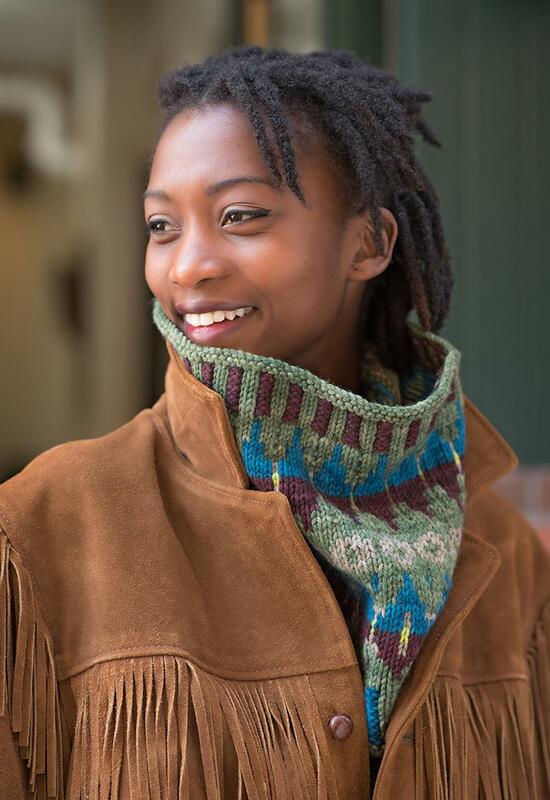 Here’s a brand-new pattern that was specifically designed for Windham Mini Skeins: Dionisio Point, by Elizabeth Elliott. As a fan of corrugated ribbing, and one who is feeling her Fair Isle skills (midway through the yoke of my Hadley Pullover), this pattern is really calling to me. 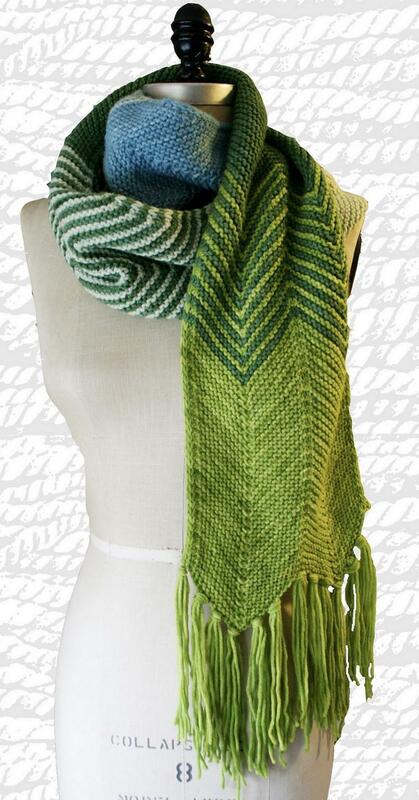 The pattern calls for one full skein of Windham plus 4 mini skein quantities. I’m thinking, if I do the background color of the corrugated ribbing with one mini skein and the rest of the background with another mini skein, that’s 6 mini skeins and no full skein. We’ll see how it goes. It’s a beauty of a pattern. Dionisio Point photos by Gale Zucker. I mean, WHOA. I want this one. 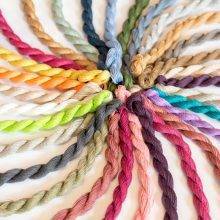 We would love to hear reader suggestions for patterns for Windham Mini Skeins. 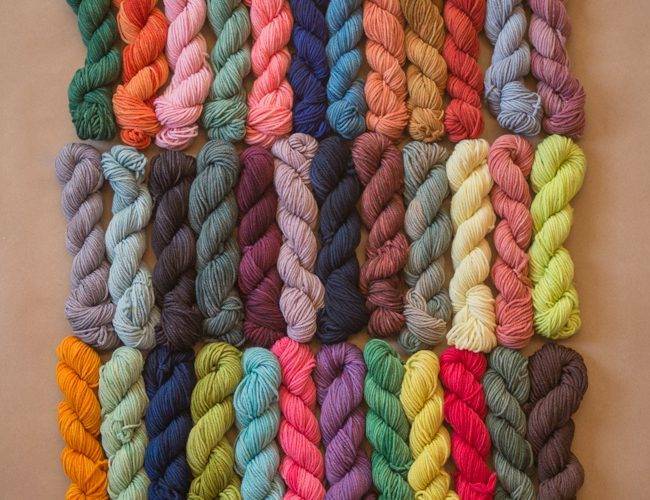 Ravelry’s pattern archives are deep and wide, and he possibilities for twelve 60-yard skeins are mind-boggling. Right now, my mind is focusing on chevrons and stripes, but there are so many other ideas out there. Let us know in the comments. In 2015 I knit Bex’s weather scarf. The pattern specifies a gradient and a different weight yarn, but the concept would totally work with these mini skeins. My scarf was coded to the high temperature every day in my area. You could totally make up this pattern on your own, but the pattern is a fundraiser for Children’s Hospital, Seattle, so if you like this idea, you should buy the pattern. Below I’m linking to the pattern, and to may scarf. 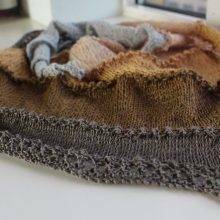 I think the set would make a great Inspira Cowl! I feel like a Stephen West pattern could be a good match. Stephen West’s Building Blocks Cowl seems made for these! If I had the funds, I’d buy one each of all three and use ’em all in a wrap-size Diagonapples! Also thinking these are crying out to be part of a Fort Tryon epic wrap! My stash was overflowing. Then you opened a shop. 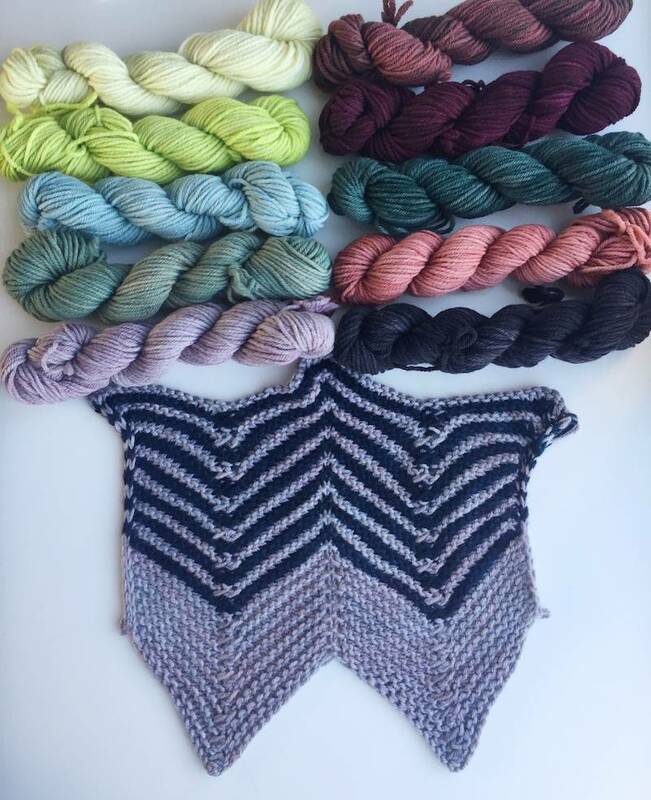 There is no hope, just yarn, and more beautiful yarn, much of which is not available anywhere else and only until it runs out, so maximum FOMO. And then you give me fabulous suggestions for lovely projects to add to my already endless Ravelry queue. Will you be opening a rehab clinic soon? Using a different mini for the ribbing MC on Dionisio Point would look so cool. I checked my notes, and I used about 121 yds of MC in total for the sample, so if you brought that colour to where the diamonds meet, I think you’d be in business! 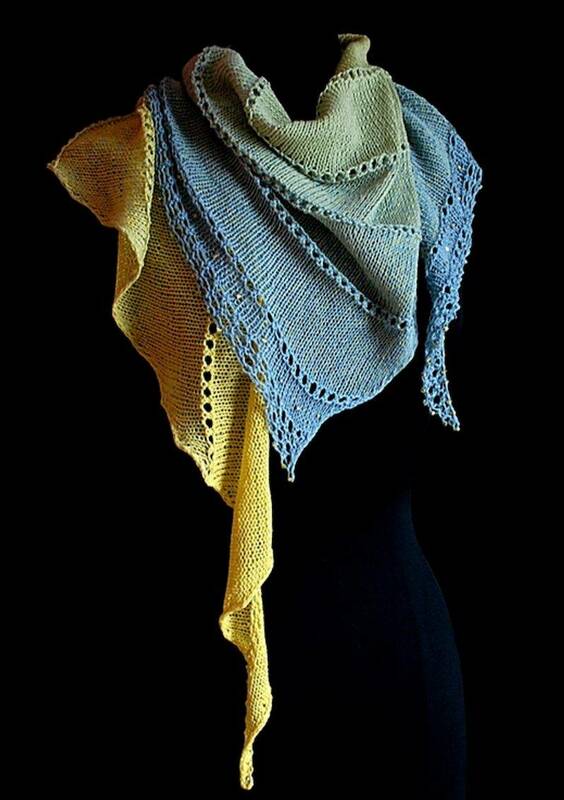 I would like to purchase all three colour ways , but I live in NZ and can’t work your online payment form to accept my address I would also like to join up for Techniques and print books too.is there any chance you send yarn and patterns down here to NZ ? Aha! Now I understand your questions about my neverending zickzack scarf. If (when?) I ever finish, I could easily take up with the Just One (More) Row. That’s a beaut. I think the mini-skeins will be perfect for http://www.ravelry.com/designers/veera-valimaki (Simple Sprinkle by Veera Valimiki). I’ve wanted to make this for years, but I have a fear of picking the wrong colors. And with the mini-skein sets Jill Draper has picked for me. Here’s the link to the cowl: http://www.ravelry.com/patterns/library/simple-sprinkle. The other link goes to all of her fabulous designs. Oh very pretty. Looks like a fun knit too. I have been trying to ignore the mini skeins, not sure I can hold out much longer. I was going to use the leftovers from my Field Guide mitts to make Dangling Conversation, but somehow the directions seemed hopelessly complicated for me, and I’m not a newbie knitter. Instead, am using three of the four colors to make a Color Affection shawl. But that’s not what to do with the mini-skeins, is it? Oh me, so distracted by the Dangling Conversation, and the the use of several different colors, and, and, and….